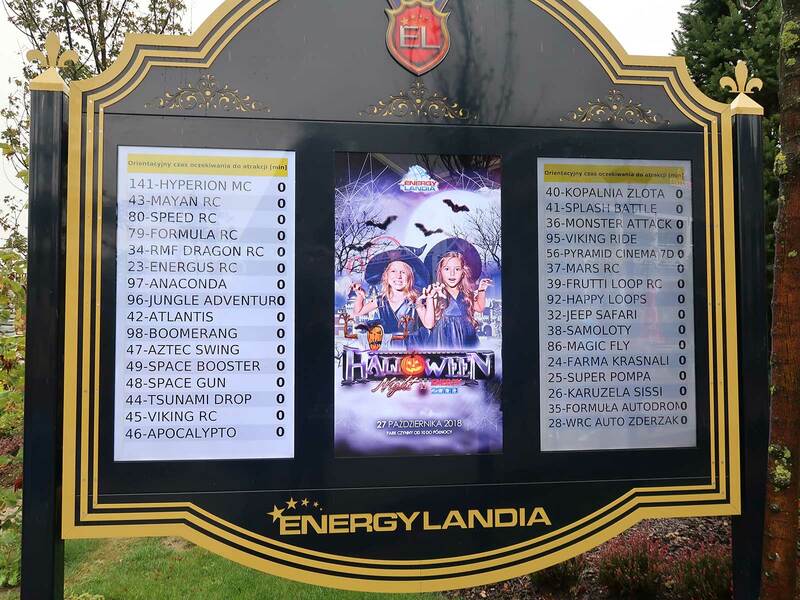 The weather forecast for our third visit to Energylandia in as many years was miserable, with heavy rain predicted for the entire day and a high of 13°C (~55°F), compared to 27°C (~80°F) for both the day before and the day after. 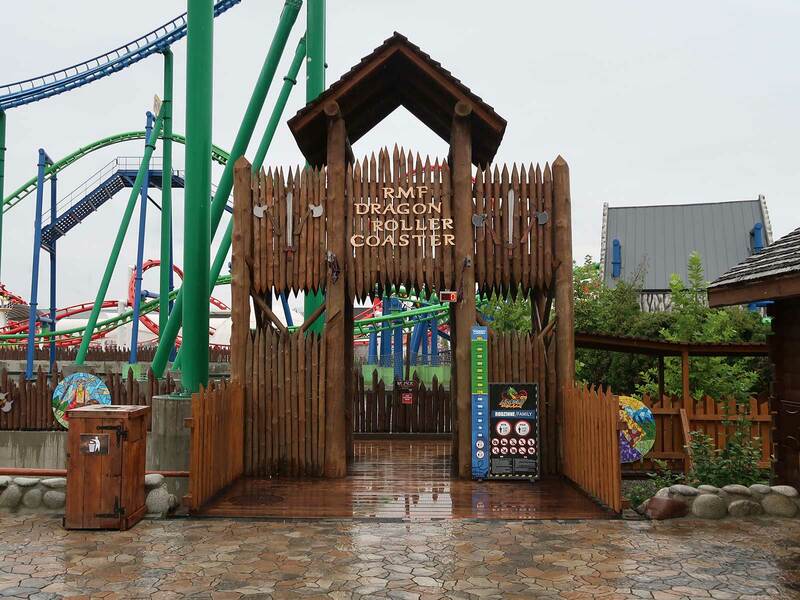 We knew from previous years that most park attractions would operate in light rain, but there was no guarantee that this policy would extend to the park's signature ride just ten days after a fatal accident. 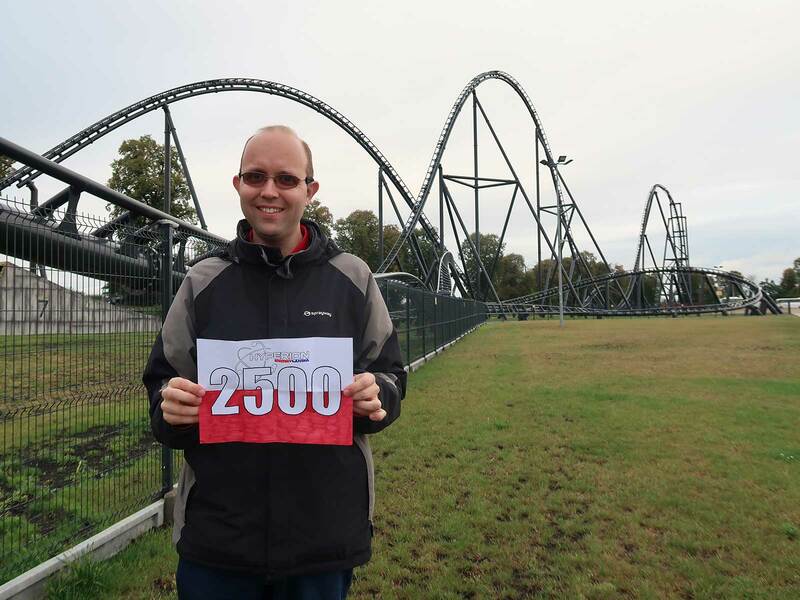 During the drive from our overnight hotel in Dąbrowa Górnicza I found myself experiencing what can only be described as "first world CreHo worries"; I'd made a stupid day trip (and skipped a travelling coaster) in the hope of marking my two thousand five hundredth coaster on a landmark ride. My long-suffering girlfriend had even made me an elaborate hand-coloured sign; was it all to be for nothing? On approach to the park our trusty GPS brought us on a particularly scenic route along single track roads through the charming villages of Żaki, Las, and Przeręb. The display said that we were less than a kilometre away, which seemed highly improbable given our surroundings, and I was right on the verge of stopping to check that I'd entered the destination coordinates correctly when the unmistakable sight of black coaster track came into view. Seconds later a dark shadow that could only be a moving train passed across the apex of a hill, and just like that my mood lightened considerably. Some ten minutes later we arrived at the entrance to the park where we found a display board showing that all rides had a wait time of zero minutes. Hyperion (#2500) is an Intamin Mega Coaster, albeit one that is quite different to previous installations. The most obvious change is a new train design that carries twenty-eight passengers in seven rows of four. Each seat has an overhead lap bar restraint, and unlike previous generation rolling stock there is more than enough room for riders with big feet. Enthusiasts will likely also spot a new track design which eschews the box structure of old in favour of a thick support spine that bears more than a passing resemblance to the latest Vekoma products. The ride has a lengthy queue that has been given a futuristic theme. At the front it divides into three separate lanes for the "first trolley", "individuals", and "all trolleys". I liked this approach, though the implementation was causing some confusion today because the explanatory signage was posted in a location only readable to those with incredible eyesight or those who'd already made their selection. At one stage when Megan and I headed for the front row queue a bunch of people behind followed us blindly, standing put for a period before reading the displays and relocating. I'd like to see the park solve this problem, which could easily be done by adding an additional sign right before the split. The front seats were already claimed for our first lap, but the back was open and we decided we might as well start there. The restraint required quite a bit of physical effort to close, though we quickly realised that this was probably good news as it reduced the likelihood of it tightening mid-ride. Readers should be aware that the operators were giving each bar an additional push during the checking process; most people should probably pout a little bit to leave themselves breathing room. After the process was complete the train was set in motion without a word or indeed an indication of any kind. The silent dispatch felt a little strange the first time round, though I quickly decided that I liked it far better than the extended "are you ready" exchanges so typical of major corporate parks. The ride uses a chain lift mechanism that is virtually silent in operation, which I'm sure comes as a huge relief to the owners of the private house on the opposite side of the road. The train slows very slightly at the apex before dropping all the way to ground level at a peak angle of eighty-five degrees. The sensation of this descent was magnificent in all seats, though it was obviously somewhat more intense at the rear of the train. The second hill delivers good airtime and a floating descent, and the third ups the ante with what is almost an inversion. The remainder of the layout is low to the ground twists and turns where the sensation of speed matters far more than forces; these culminate in a water splash effect (fortunately not in use today) and a bank of magnetic brakes that bring the train to a smooth stop. We did five of our seven laps in the front seat, which was definitely the place to be. The airtime in the back was better, but it didn't quite compensate for an unpleasant rattling that was particularly noticeable on the right hand side of the train. It felt like there might be a flat spot on one of the wheels, which apparently have wear issues; if you stand at the back of the station and look closely at the brake run you can see a number of free-standing fans that have been installed in an attempt to keep the mechanisms cool. It was the rattle that keeps me from labelling Hyperion as a top ten coaster, though I'd still list it as well up there with the very best rides both in Europe and worldwide. When we visited Energylandia towards the end of last year construction of the park's water coaster was still underway, which at the time felt like a blessing. The ride has since opened, and as we needed our tick we decided that we'd do a lap even though it was bitterly cold and we were wearing jeans, a timely reminder (should anyone still need one) that coaster counting is an exceptionally stupid hobby. Speed (#2501) features a vertical lift and a fifty metre drop with a water spray, a turnaround, and a descending helix into a splashdown. The rapid ascent and initial drop were enjoyable, but the rest of the layout was pretty boring, and worse yet the boat rattled its way through it like an Arrow product from the seventies. The one piece of good news was that we'd chosen our seats well, and though we didn't come off completely dry it could have been much worse. With apologies to the fine people in Intamin, any park seeking a water coaster would be well advised to go to Mack Rides instead. The park has over forty places to buy food, but virtually all of them were closed today as a result of low guest numbers brought on by the miserable conditions. We were unable to find a list of what was and wasn't open, and without conversational Polish there was little hope in getting details from a staff member. We decided that our best bet was a quick lap of the park to figure out what our options might be, and having done that concluded that there were only two choices: the table service Royal Restaurant near the park entrance, and the considerably less formal Restauracja Scandinavia adjacent to the Jeep Safari. We selected the latter, and spent the better part of an hour relaxing over a meal. When the time came to face the world again we headed for Monster Attack, the park's target shooting dark ride. In a change from previous years the show building was filled with dry ice mist, and this actually improved the experience significantly as it was no longer possible to see the rough edges on the low budget physical sets. That being said, the experience still suffered from the lack of an onboard score display in the cars, and a display at the exit really didn't help as it never occurred to us to make a note of our car number. The park clearly isn't short of money, and given that I'd like to see them spend some of their budget on upgrading this ride, as a little investment would make it an awful lot better than it currently is. It looked at first glance like the Dragon Roller Coaster was closed today, as the entrance we remembered was blocked off. On closer inspection however it became apparent that the queuing area had been extended around the corner from its original location, adding roughly seventy metres (and presumably an hour or so) worth of cattle grid. Today we were able to walk through all of it and directly into the back row, which I'm glad to say no longer features an upcharge VR option. Our lap was excellent; I firmly believe that the 453m design is the finest of the four production Suspended Family Coaster layouts offered by Vekoma, and the theming on this model takes what was already a good ride to another level entirely. By this point we'd ridden everything on our must-do list, so we began to work our way around secondary attractions to fill time. A fun back seat on Boomerang was followed by two courtesy laps on Energus Roller Coaster that were memorable chiefly for the fact that we didn't risk second degree burns from the seats. With that done we made our way to Atlantis, which remains the most unintentionally hilarious rapids ride I've had the pleasure to experience. It was tempting to remark "I want to go on something more thrilling than Rapids #1! ", though in reality the enjoyment factor of this embarrassment of a ride far outweighed the negative excitement, intensity, and nausea factors. Park management decided to supplement this with an Intamin rapids this season, and I can report that Jungle Adventure is indeed far closer to what a ride like this should be, though still fairly soporific in the grand scheme of things; one lap was enough for us.